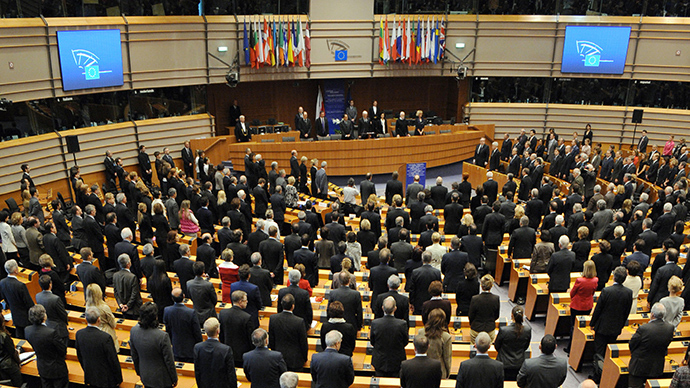 A new package of sanctions against Russia has been adopted by the EU. Previous reports said the "further restrictive measures" were aimed at targeting three major oil companies, as well as the defense sector. According to a Monday statement by the president of the European Council, Herman Van Rompuy, the new package was adopted through written procedure, "deepening the targeted measures of 31 July." "The sanctions aim at promoting a change of course in Russia's actions destabilizing eastern Ukraine," the statement reads. Although it was previously reported that the new sanctions could come into force by Tuesday, the final EU decision did not specify the date when they will be applied, only saying it "will take place in the next few days," leaving time "for an assessment of the implementation of the cease-fire agreement [in Ukraine]." "Depending on the situation on the ground, the EU stands ready to review the agreed sanctions in whole or in part,"Van Rompuy'sstatement reads. Over the weekend, some EU diplomats told Reuters that the sanctions could be lifted if the ceasefire between the Ukrainian government and militia forces holds. The truce was agreed last week. "A ceasefire must hold for sanctions to be lifted," the agency quoted a senior EU diplomat as saying. According to some EU representatives, the sanctions could "even get ridden off entirely." Despite some shooting over the weekend, "overall the ceasefire held," an OSCE security watchdog said on Monday, adding that "it is still shaky." The new package of sanctions is reportedly aimed at Russian state-owned oil companies, particularly Rosneft, Transneft, and Gazpromneft. On Monday, Prime Minster Dmitry Medvedev warned that Russia may shut its air corridors to Western airlines if the next round of European sanctions hits Russia’s energy sector. In order to be approved, the restrictive documents needed to be signed by all 28 member states of the European Union. There were reports that the decision did not go through at once, and an EU ambassadors emergency meeting had to be called, as some governments had second thoughts on the new 'punishment' for Moscow. "The ceasefire is an enormous step forward and with that comes the possibility of a political solution...There is quite a strong appetite across Europe for saying we want a political solution here, we don't want a ramping up of the economic pressure," British opposition MP and peace campaigner Jeremy Corbyn told RT.